Those who have had the childhood experience of sleeping on a bed of hay will never forget the wonderful feeling or the sweet aroma. 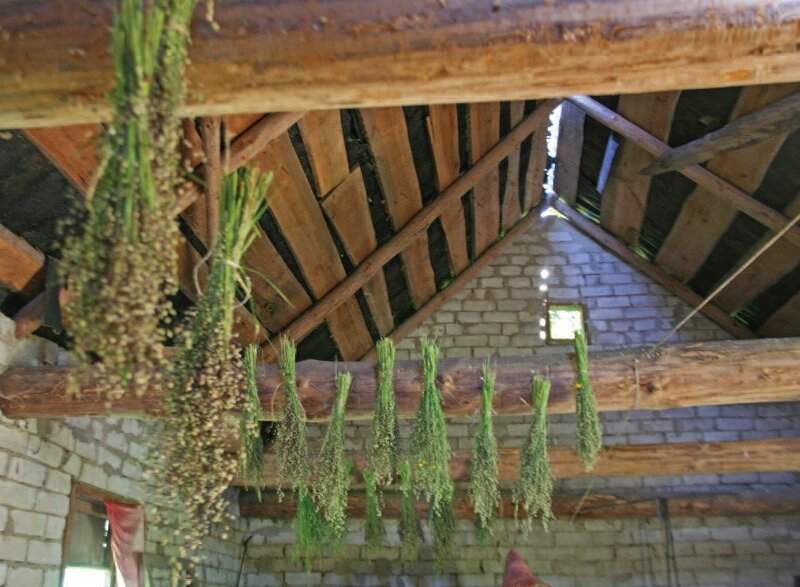 Such scents have shadowed folk artist and folklorist Gintvile Giedraitiene her entire life; and for the past seventeen years, hay and other grasses have become a source of income for her as well. 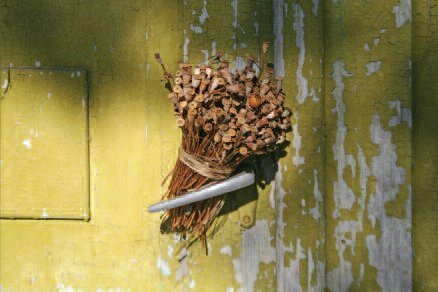 Gintvile’s house serves as her home, workshop, and storeroom and greets you with the odor of fresh grasses and herbs. 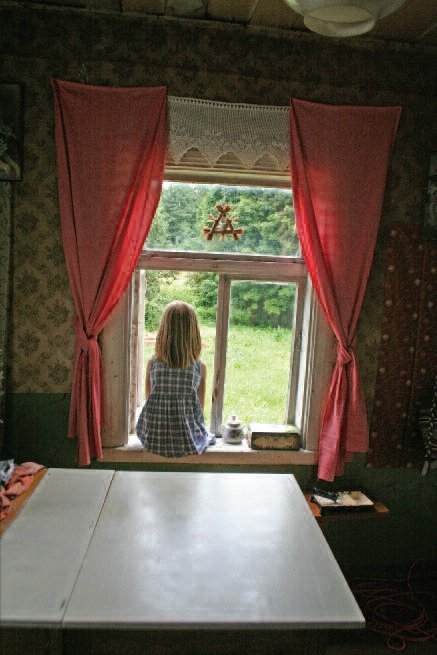 She lives in a small apartment in Prienai, in a highrise built during the Soviet era. When the weather turns warm, she travels to an old homestead in the countryside where she collects plants from fields and meadows. Hay cut with modern farm equipment would not be suitable for this folk artist. 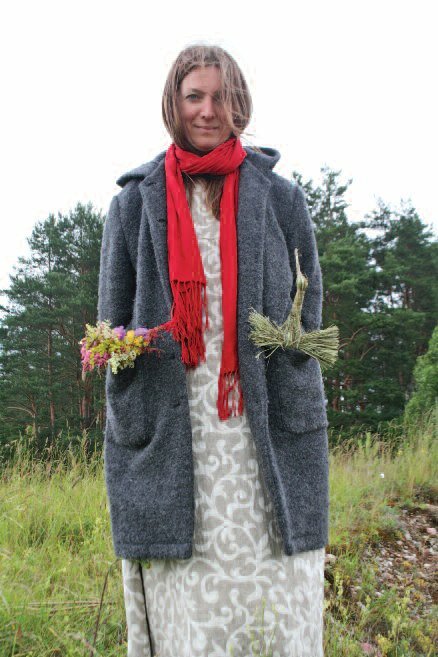 She goes to the fields with garden scissors to hand-cut flowering grasses, carefully conserving each stalk and blossom. 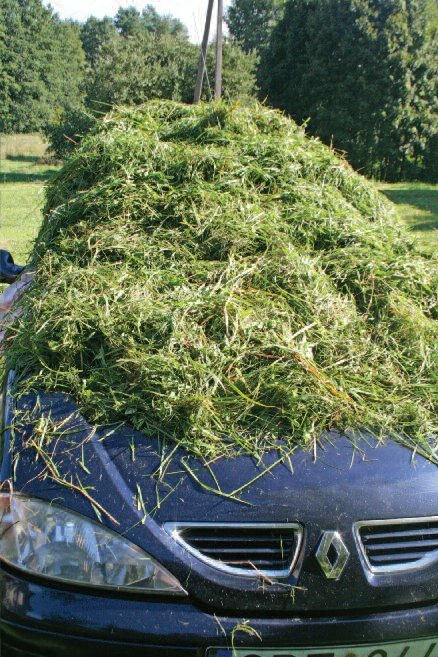 Returning to her farm cottage, Gintvile lays her grasses out to dry on the carpet or furniture sometimes even on the roof of her car an ideal drying location. Then she carefully gathers the dried plants and stores them in sacks to be saved until fall. Grasses drying on the rafters. In autumn, when the days grow short, Gintvile retreats to her workroom. In one hand, she takes a tuft of dried hay and, in the other, a thread of unspun flax. Her hands work their magic, and within minutes, meadow flowers and grasses are reborn as a bird, a horse, or a decorative detail in a larger work of art. The only artificial product the artist uses in her creations is plain paper paste, which is needed to glue the flaxen threads together. All other elements of her works grasses, blossoms, mosses, leafy fronds, twigs, and dried berries from various trees and bushes are natural and unmodified. Unlike many other verba makers, she does not use dyes to tint her creations. This naturalistic aspect of her work has attracted many admirers. “From the time I was a small child, I was attracted to the woodlands and fields. I enjoyed playing alone in the meadows and forests. When you spend time in solitude, you really begin to ‘see.’ I would sit or lie quietly for hours; I would greet the rising sun and see it set in the evening; I was content and needed no special entertainment or playmates,” Gintvile recounted. Spending hours upon hours in the country, the young girl would collect all sorts of plant life and bring her bouquets home to dry, an activity that was tolerated, but not especially encouraged, by her family.“No one understood me, or why this was important to me,” remembers Gintvile. While still in middle school , Gintvile in advertantly set off on a path leading to her future career. She created a collection of verbos (decorated Easter “palms”) and brought them by train to Vilnius, where she sold them in front of the Gate of Dawn in the heart of Old Town. “I did this not for the money, but because I was searching for new experiences. I was simply following a strong inner impulse,” laughs the artist. Her entrepreneurship ended as quickly as it began. She needed to move on to high school and consider further studies. Dried poppy pods stored safely for the next group of žolinukai. 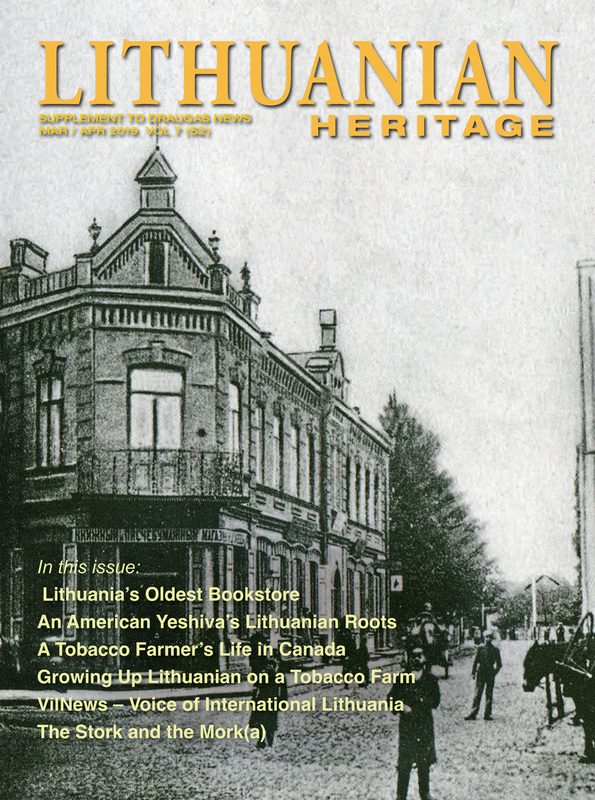 After her studies, Gintvile moved from Kaunas to the nearby town of Rumšiškes, where she got a job at the Open Air Museum of Lithuania, a folk museum depicting traditional country life. Surrounded by nature, Gintvile first submerged herself in painting and poetry but then rediscovered her early fascination with the plant world. “Plants are my first and lasting love, and this friendship and loving relationship has borne fruit,” the artist maintains. An accidental discovery returned Gintvile to her creative roots. When she was a young mother living in the small resort town of Birštonas and moving from place to place, Gintvile and her family felt a strong desire to own their own home, a home surrounded by nature. There was, however, no money. Gintvile prayed that she could find a source of income and fulfill this dream. Herprayers were heard: In the attic of an old house, Gintvile found a ball of tow (remnants of flax-fiber combings). She took it home and, unconsciously kneading the fibers in her hands, shaped them into a bird! 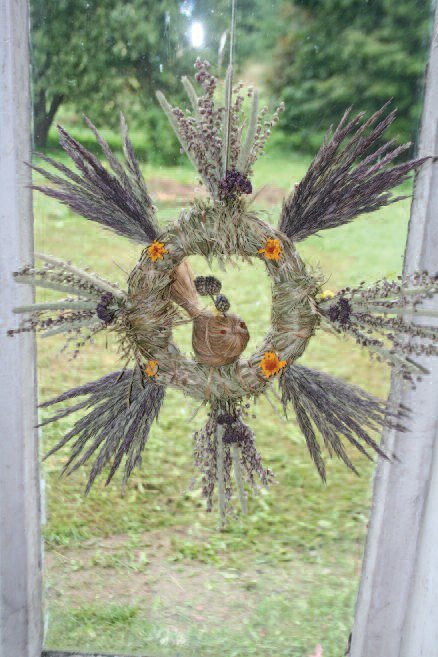 She added dried grasses and other natural objects she had gathered. Her creativity took off. Gintvile was familiar with various souvenirs made from natural materials, but started to create her own style and ethos with painstaking constructions more commonly reserved for jewelry. In addition to her artistic work at home, Gintvile began working at a center for culture and folklore and became recognized as a folk artist. She named her artistic works žolinukai (grasslings), a term of her own creation that beautifully captures the essence of her art. None of the expert folklorists knew how to categorize Gintvile’s work, because it represented a new and original genre. As an artist, Gintvile kept her talent to herself, but willingly taught and shared her techniques with interested crafters. 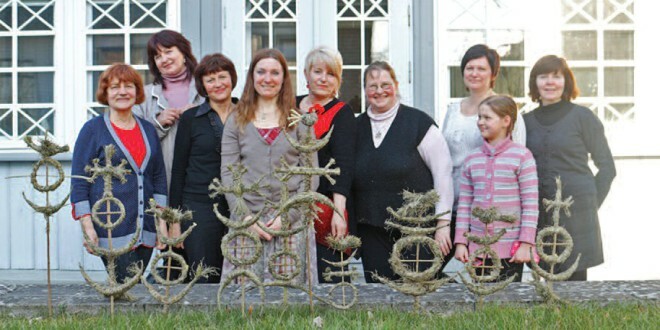 Folk art made from hay and other grasses is now popular in all parts of Lithuania. Gintvile is pleased that creative people not only use her basic techniques, but add their individual stamp and self-expression to the objects they make. Some people try to copy Gintviles work. The artist is not very concerned, however, because she believes, although handicrafts can be made by many, they don’t all rise to the level of art. “Certain paintings affect and move the viewer others, don’t. Art needs to be more than visual representation; it must have spiritual content and express a deeper reality,” the artist explains. Each žolinukas contains a bit of her spirit that Gintvile trusts will leave a markedly different impact than a mere copy would. 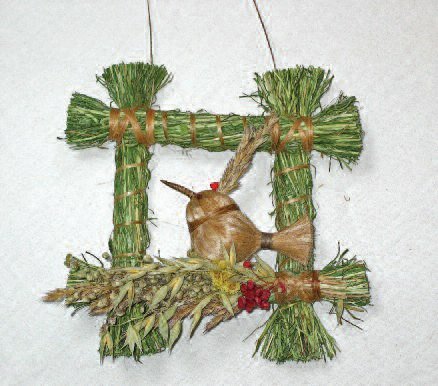 … and she made them into a little bird. The artist admits she could produce large numbers of žolinukai factory style and make a fair amount of money, but she can’t work in such a mechanical fashion. Every piece is art. In her hands, one bird is formed happy, another sad; one is a drake, another a duck. As in life, each is an individual, each is different. … a bird in the bush. Gintvile explained that the style elements in her work are not preplanned, but intuitive. Ancient Baltic symbols representations of the sun, moon, crosses, etc. are incorporated into her work almost unconsciously. A žolinukas, with all its meanings, seems to come into existence of its own accord. Her birds represent freedom, messages, the sky, flight, and soul; the sun symbolizes light, heat, life, and fire. The circle is a reminder of infinity and eternity. The tree of life represents a confluence of worlds, of the past, present, and future, and is a symbol of the fullness of life. The cross describes the passing from death to Life, the junction of spirit and matter, and is a symbol of faith, love, and sacrifice. 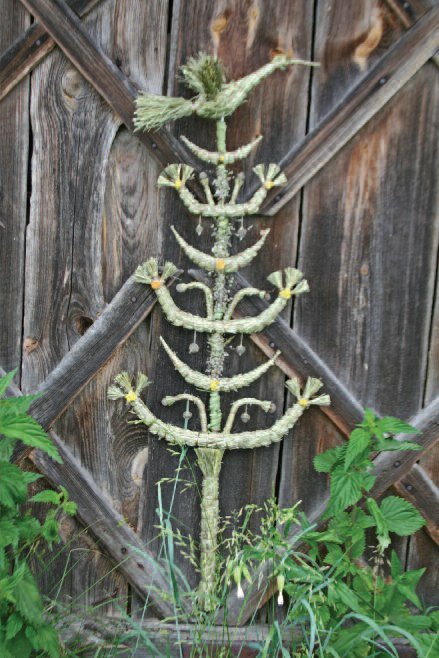 Often people ask Gintvile to create a žolinukas for a special occasion, or as a gift for a christening or marriage. The artist has even puzzled out adaptations for the interiors of cafes. She refuses commissions, however, when customers try to dictate the process. Gintvile believes her work must flow from her own spirit, and she prefers to suggest ideas to clients. Since they can be ordered via the Internet or acquired at art fairs and handicraft stores, many of her žolinukai can now be found in countries around the world. With the passage of time, the green shades of fresh žolinukai slowly become a variety of yellows and browns. This change doesn’t diminish their appeal, however. Žolinukai are like antiques, whose value increases with time. As long as they are kept in dry and proper conditions, there is no danger of deterioration. Even though she has made thousands of žolinukai, Gintvile can enjoy most of them only in photographs. She has only a small sample of her work at home and dreams of creating a special collection for her own pleasure. Žolinukai helped Gintvile survive life’s storms and losses. She is the mother of two and the owner of an old farmstead where she spends her summers working. Her country home is a source of great joy, but also has its share of problems. The roof is deteriorating and she doesn’t have the resources to repair it. Gintvile prays for another miracle. Žolinukai have helped her in the past, and she hopes they will do so again. 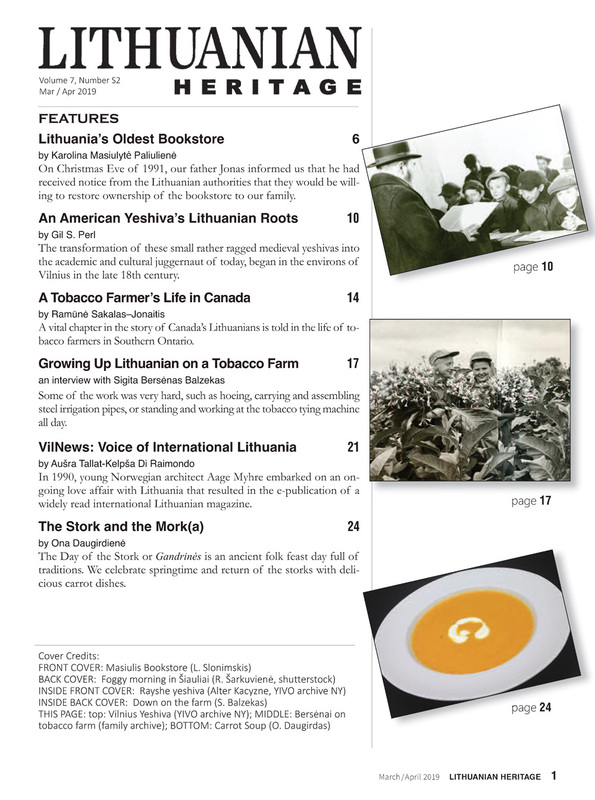 Vereta Rupeikaite is a freelance journalist living in Lithuania. For those interested in purchasing žolinukai, please contact Gintvile at this email: ggiedrazole@gmail.com, or via her Facebook page: https://ltlt.facebook.com/gintvile.giedraitiene. Previous Who Betrayed Juozas Lukša?